Secures your ID from any angle using the included swivel spring clip. 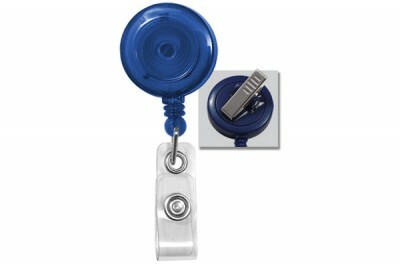 This translucent blue, round badge reel comes with a 360-degree rotatable swivel spring clip that allows IDs and other accessories to be attached from any angle. The 34" retractable cord makes it easy to extend access cards for swiping or for inspection at eye level. It also comes with a clear vinyl strap designed to hold slot-punched ID cards. The clip is quite strong. I highly recommend this as a good alternative to lanyards. It looked sturdy on this site's pictures. I made an order and am not disappointed with the quality. Will definitely order more. I ordered and charged it to the wrong credit card. I called support and they immediately helped me correct the mistake. I am quite tall and often have trouble when swiping my access card. This cord's 34" length is just right for me. Unlike other reels we have tried, this one stays clipped on your breast pocket even when you accidentally bump into someone.